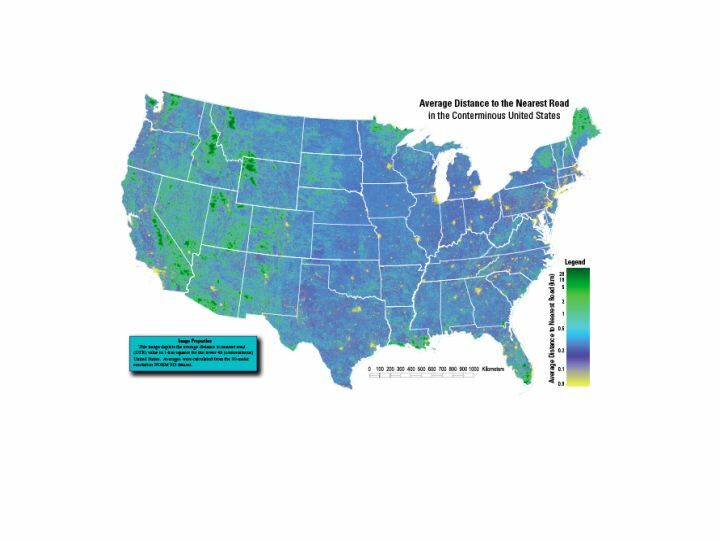 Satnavs may be killing the ability to read maps (and visualize anything but roads or Taco Bells in the topographical landscape), but I for one am a resolute devotee of maps and all the knowledge and mystery they portray. This includes, of course, place names, and the often-curious tales behind them. Nowhere is this historical narrative better studied than George R. Stewart’s landmark Names on the Land (recently reissued by New York Review Books), with a fine new introduction by my pal Matt Weiland. Passages like these will be read by me, Colson Whitehead, and Mike Wallace on Tuesday, September 2nd at 7:00 p.m. at Brooklyn’s BookCourt. There are rumors of a place-names pub quiz — but just rumors. Comments Off on ‘Names on the Land’ Reading at BookCourt. Click here to leave a comment. While I was abroad Randall Stross wrote a good piece in the New York Times (here or below the jump), in which I was quoted briefly, about Chrysler’s plan to equip its cars with WiFi internet access. Given that the car manufacturers worked carefully to come up with standards for things like restricting the number of commands that could be used on nav systems while driving, it seems to me extremely negligent that they would then essentially toss that caution out the window to enable full-on internet surfing in their cars. Unlike simple information gauges in the car, the laptop screen offers a much more immersive environment, in any number of ways: the small size of the display information, the richness and complexity of the information, the necessity to scroll through various screens, the location of the computer away from the windshield, the potential to input responses, even the slow download speeds, which might cause the driver to keep looking to see if it’s finished, etc. Lord knows how they would type and do that quaint thing that we used to call simple, non-distracted, driving. As an example of what internet surfing would mean on the road, just imagine, in the amount of time it took you to read this sentence, you’d have traveled, if moving only at 30 mph, nearly 100 feet — imagine if you were going 70? Chrysler says this is meant only for backseat use, presumably by children, etc., spending an ever greater portion of their childhood development strapped into the back of so-called “living rooms on wheels,” and apparently ever desiring of non-stop connectivity lest their dwindling attention spans suffer a flameout. An easy way for Chrysler to defray criticism would be to simply allow the service to only be enabled while the car isn’t in motion, as one sees with in-car DVD systems. That is a sane and useful service. I’m curious to see how the liability on this will shake out — I do know if I got t-boned by someone who was updating their MySpace page on Chrysler-provided bandwidth I’d go looking for the deep pockets in a lawsuit. Yes, drivers should be responsible for their actions, but given the myriad ways things can already go wrong on the road, why should the car-maker expand the options with its options? There’s any number of reasons why this move only makes sense in the world of a struggling car-maker seeking anything it can to distinguish its product in a hostile environment (and have thus made the driving environment more hostile). The car manufacturers used to be rightly criticized for skimping when it came to producing safe cars. They’ve come a long way towards putting that history behind them — cars in and of themselves are less dangerous for their occupants — so it’s all the more puzzling to me that they would suddenly put the car in reverse, as it were. Comments Off on This Information Superhighway Thing Is Getting a Bit Ridiculous. Click here to leave a comment. Apologies again for the interruption in programming, but I’m in London promoting the book and there’s precious little time for bloggery. For your momentary amusement, however, I offer this Disney short (which predates even Motor Mania), which offers a suggestive cartoon glimpse at the state of driving conduct circa the early 1930s. Comments Off on Traffic Troubles (1931). Click here to leave a comment. Comments Off on Traffic Jams, Part 2. Click here to leave a comment. Comments Off on Eyes on the Street. Click here to leave a comment. 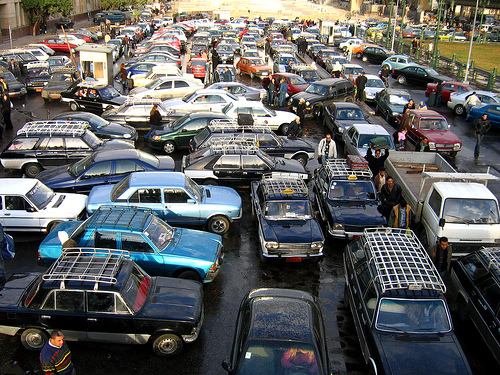 That’s what one tourist said about Cairo traffic. But as of late there’s some new laws on the book aimed to calming the country’s famously manic traffic. Readers of the book will know of my interest in corruption and how that trickles down to traffic, and it’s no exception here. The question is: When laws are made stronger (ostensibly with a reformist goal) in a place plagued by corruption, does it improve things or simply raise the rent-seeking abilities of corrupt officials? One problem is that some of the new regulations seem Byzantine and not particularly relevant to traffic safety, like requiring fire extinguishers and obligatory first-aid kits in cars. Political analyst Amr El Shobaki was quoted in the FT: “The new traffic law is an example of the rise of extortion in Egypt… [W]ith some effort and sensitivity, the authorities could have presented legislation that improves the situation on the roads, instead of one which seeks to extort money and spread corruption.” I’ve not seen, for example, studies showing how the presence of a fire extinguisher helps eliminate the most common causes of road danger (speed, alcohol, red light running, etc.). And bribery is, of course, a regressive tax. “The fines are now so high it will no longer be enough to pay off a traffic policeman with E£5 or E£10 [$1.90, €1.30, £1],” said Salah Abdel Ghani, a taxi driver. “This is a law that will affect only the poor, like those who drive taxis and pick-up trucks.” On the other hand, it is noted, the children of wealthy families obtain their licenses before they’ve even learned to drive. Comments Off on “I feel as if I am in a circus all the time”. Click here to leave a comment. Via Boing Boing, I couldn’t resist this story of a California Mayor shutting down a neighborhood vegetable stand run by a couple of young girls. The reason? Traffic was being stopped. This is a neighborhood street mind you, and the vegetable stand the girls were operating was well within the school of David Engwicht’s “Mental Speed Bumps,” one of those little interesting moments of human life that actually reminds drivers they’re moving around in a human environment and not simply a high-speed thru-way. Stopping traffic? That’s exactly the point — they’re stopping to buy fresh tomatoes. What next — yard sales? This is the same sort of zoning lunacy that prevents people from growing vegetables on their own lawns to begin with, and I bet the mayor will be eating political crow on this one. Comments Off on She Can Stop Traffic, Part 2. Click here to leave a comment. 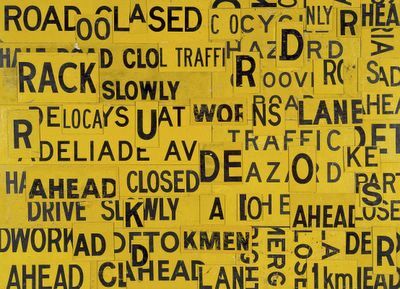 On the heels of the “traffic movies” entry, here, from the department of traffico-musicological studies, comes a list of songs about traffic that spoke to me in some way while working on the book. These are traffic songs, mind you, not “car songs,” per se, so you won’t find (maybe with some slight exceptions) any tired old paeans to Cadillacs or homages to the lure of the open road (because I’m more interested in the less-than-open road). Rather, these are songs that somehow related to some part of the weird traffic world I’ve been investigating. Nothing against Stevie Winwood, but there are no songs by the band Traffic here; I was also dismayed to find out the song “Roundabout” by Yes is not actually about intersection treatments (though I’m still not sure what that song is about in any case). 1. “Crosstown Traffic.” Jimi Hendrix. OK, granted, this song isn’t really about traffic. When Hendrix sings: “All you do is slow me down/ And I’m tryin’ to get on the other side of town”; or “But darlin cant you see my signals turn from green to red/ And with you I can see a traffic jam straight up ahead,” we can assume he’s not really concerned with intersection capacity or Levels of Service. Still, it begs the question: If the narrator had congestion pricing in his town, would he be able to get that much faster to those “better things on the other side of town”? 2. “Autobahn.” Kraftwerk. Who even knows what they’re really singing here — with BabelFish, you get some vaguely poetic, though no doubt mistranslated, glimmerings: “The lane is a grey volume/ White stripes, the Green edge.” But sort of in the way I wish all airports actually played Eno’s Music for Airports, instead of horribly loud CNN, I wish all highways actually sounded like this. Perhaps, as with Japan’s “melody road” paving scheme, engineers could record “Autobahn” into the pavement, like grooves on vinyl, and driving the proper speed would yield this sonic surprise. 3. “Expressway to Your Heart.” The Soul Survivors. Rather like Hendrix, this isn’t really about traffic, but about trying to “get through” to a woman. “Now there’s too many ahead of me/ They’re all the time gettin’ in front of me/ I thought I could find a clear road ahead/But I found stoplights instead.” But it’s a nice description of actual traffic woes, and who couldn’t love a song that begins with horns honking? “Expressway to Your Skull,” by Sonic Youth, also rates here — at least as a title. 4. 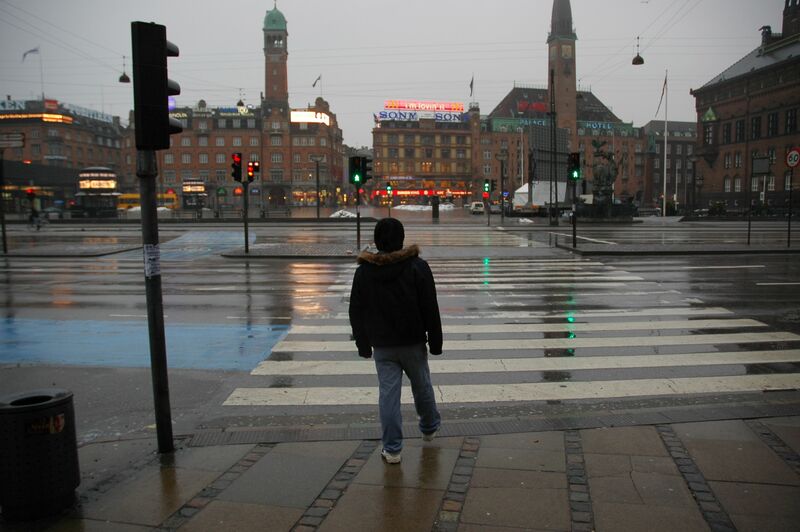 “Traffic and Weather.” Fountains of Wayne. I’ve been in a lot of morning TV studios lately, and it’s always fascinating to me the way “traffic and weather” are lumped together, as if they were both natural forces, full of trends and patterns, both to be monitored by various sensors and “forecast.” This song uses that conceit for a bit of romantic suggestion: “Oooh we belong together/ Like traffic and weather/ Like traffic and weather.” The Fountains are also to be commended for “’92 Subaru,” which imagines the eponymous vehicle as the ultimate chick-magnet. but she can stop traffic.” I suppose buried in there is some notion of the role of external sources of driver distraction and its deleterious effects on traffic flow. 7. “Traffic Jam.” James Taylor. I’m no big JT fan but let’s give credit for just coming up with a little bluesy ditty about congestion (if only because he know he’d clock future royalties as it was played to death during drive-time traffic updates), with its surreal moments: “Now I almost had a heart attack/ Looking in my rear view mirror/ I saw myself the next car back/Looking in the rear view mirror/’Bout to have a heart attack.” Actually, I should really rather cite Artie Shaw’s “Traffic Jam” instead, which does a nice job of simulating the flow of traffic (at least as it sounded in the 1930s) vis a vis big-band arrangement. 9. “Don’t Think About Her When You’re Trying to Drive.” Little Village. The John Hiatt & Co. “supergroup” offer this subtle reminder about the dangers of distracted driving as the narrator looks to put a little distance between himself and his ex-love. There’s a kind of companion song here recently out from Ry Cooder in I, Flathead, “Drive Like I’ve Never Been Hurt.” We could go down this road all day, with Lucinda Williams’ “Car Wheels on a Gravel Road,” etc., but I’ll stop now. Comments Off on My Top 10 Traffic Jams. Click here to leave a comment. 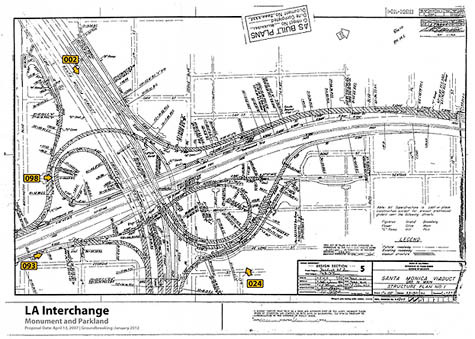 I was intrigued by the conceptual art piece pictured above, Luther Thie’s LA Interchange, which I read about recently via BldgBlog. This idea put me in mind of several things. 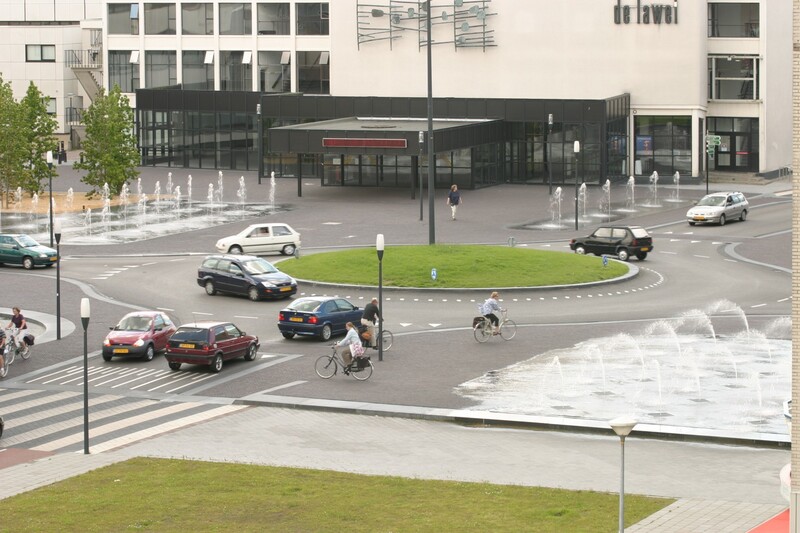 First, the fountains at the laweiplein in Drachten, in the Netherlands, home of the famous un-signed “squareabout” pictured below. These water levels rise with congestion, however, not fatalities. 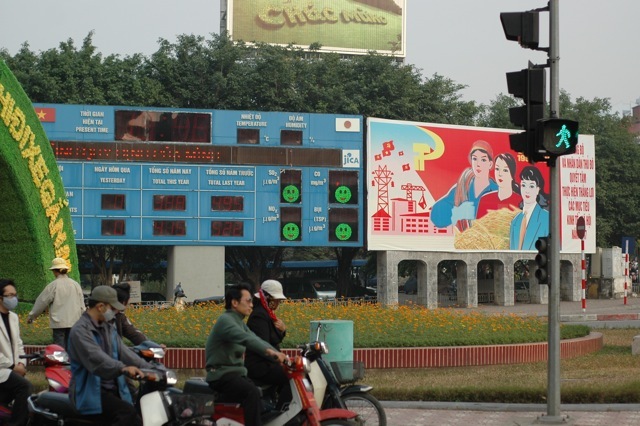 More directly, however, it reminded me of something I had seen in Hanoi, Vietnam, in the busy intersection near the Daewoo Hotel off of Kim Ma Street: A giant billboard (pictured below), sort of Fenway Park meets Socialist Realism, one section of which reported ongoing road fatalities (and thanks to Greig Craft at the nearby Asia Injury Prevention Foundation for pointing this out to me). It’s not quite visible in this shot, but there are categories like “traffic fatalities this year,” “today,” etc. — as well as time and temperature. It’s an interesting idea, and one that I’ve not seen replicated anywhere else. 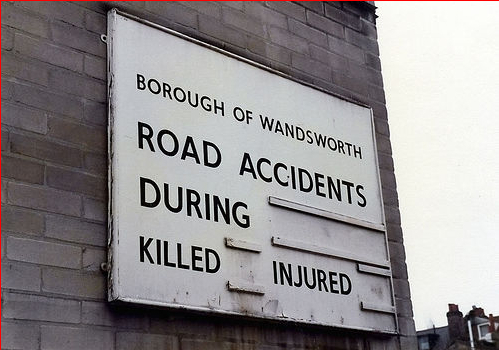 It recalls the sort of factory-floor safety campaign signs one sees (“X days since accident”), depicting information that we generally don’t have access to as we drive — feedback if you will (and apparently this has been tried at least one other place, as the photo below shows). I’m not sure to what extent this would change behavior, or what people would draw from the information, but as it now stands the only way we are reminded of the danger of the road is the impromptu roadside memorials (or “ghost bikes”) that are erected (and typically removed by highway departments). But I’ve often wondered if leaving those memorials up would be more effective than other traditional warning signs, in terms of influencing behavior. Comments Off on How’s Our Driving?. Click here to leave a comment. When in London next week I will certainly be headed to the British Library at some point to see the small exhibit on weird and wonderful gadgets collected by Maurice Collins. 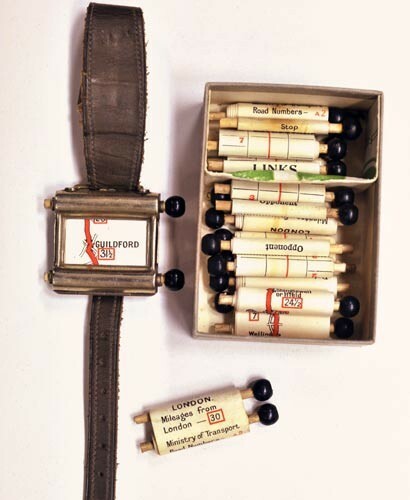 Of particular interest here is this wrist-watch style navigation system, called the Plus Fours Routefinder, on which the driver would wind the little scrolled paper maps along as he drove (not sure what to do if the main route was congested). The Routefinder, which covered a variety of routes, featured updated distances as well as a “Stop” instruction — but hopefully you would realize you were in, say, London before the little device said so. Not sure if listed petrol stations and the like. Comments Off on Steampunk SatNav?. Click here to leave a comment. As I’m going to the U.K. next week, I was particularly interested to come across these lines from Robert Macfarlanes’s scintillating book The Wild Places. Comments Off on An Absence Also Becomes Visible. Click here to leave a comment. Just a quick alert that my Wilson Quarterly essay on Hans Monderman is now available online. I’ve also posted the text after the jump, but I always recommend checking out the WQ site in general. Comments Off on The Traffic Guru. Click here to leave a comment. There’s absolutely no reason residential streets, like the one pictured above, shouldn’t have trees in the middle of the road. Apart from the aesthetic contribution, they’re great natural traffic calming devices. Yes, you have to slow down to navigate around them, yes they reduce the “sight distance” of whatever lays beyond (hence you have to slow down), and yes they are a crash “hazard” — if you act in a hazardous way. Unfortunately, in too many places in America, someone would come along at a speed they shouldn’t be going — or maybe they’re otherwise “impaired” — and they smack into the tree, fatally or otherwise. 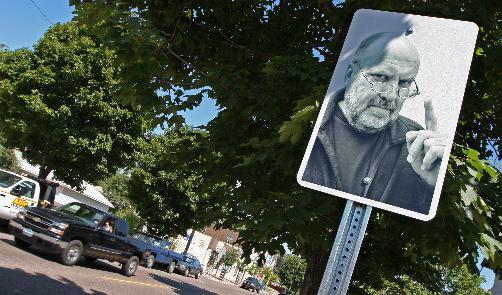 The town, worried about safety and lawsuits, etc., calls for “improvements” to be made to the street — beginning with cutting down the offending tree as a “safety measure.” Of course, on the new widened, standardized road, speeds will thus increase, shifting the hazard from the drivers of cars to the residents of the neighborhood themselves. Idiot-proofed streets tend to breed idiotic behavior. 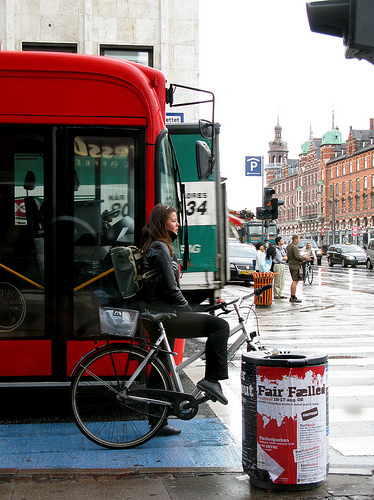 Signs, as any number of studies have shown, are essentially useless at slowing drivers. 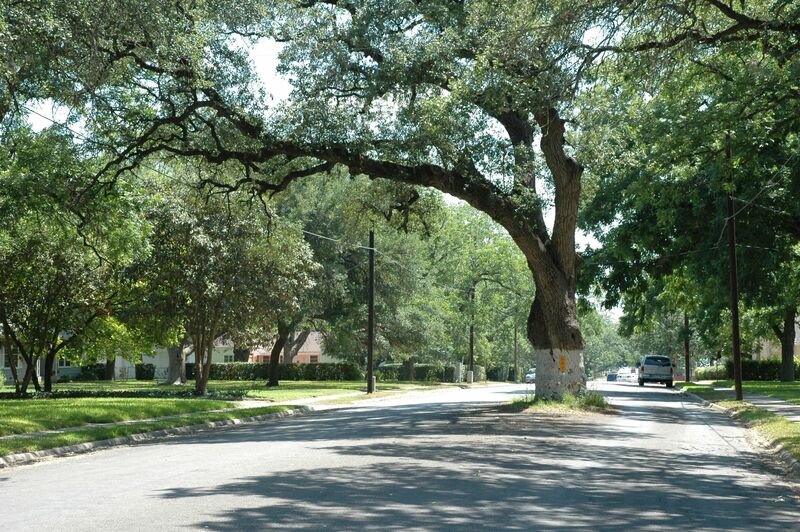 That $15,000 would be better spent on a planting a tree or two — in the middle of the road. 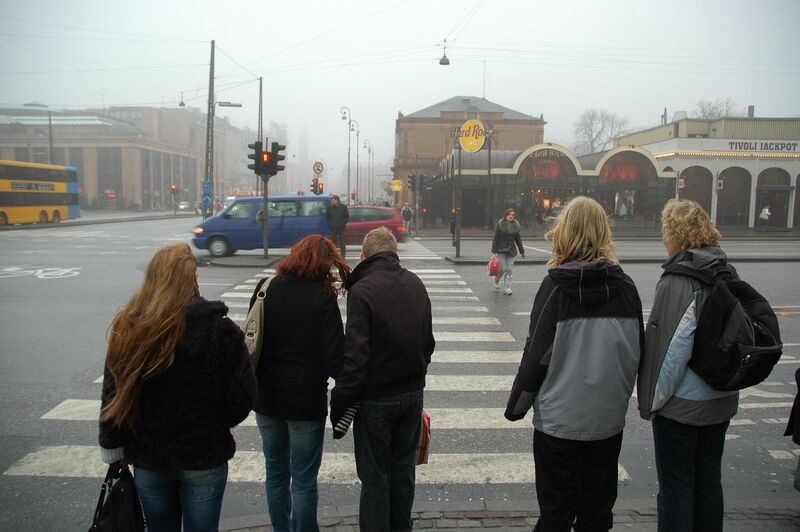 Comments Off on Natural Traffic Calming. Click here to leave a comment. 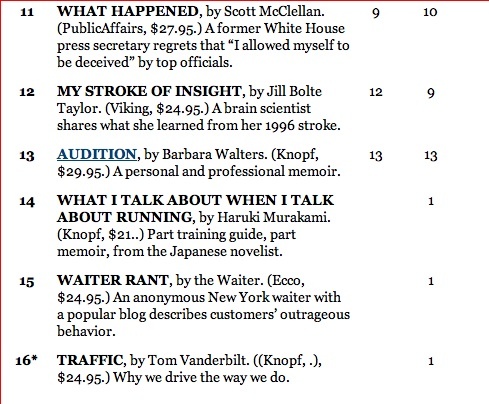 More regular posting will return now that the U.S. portion of the book tour has ended. It was a dizzying week, with loads of entertaining radio appearances, and some talks before Microsoft, the Seattle Chamber of Commerce, and Google. The last was particularly fascinating as it was my first visit to the campus at Mountain View, an otherworldly place of lunch-time volleyball games, “Expecting Mother” parking spaces, Chinese language study groups, free smoothie bars and gyms, and, brushing right past me, a pair of cleats in hand, Sergey Brin. The Google audience was very friendly but with challenging questions, and my favorite moment came when one person asked me to sign his speeding ticket — acquired while he was listening to me on NPR’s Fresh Air! I can only imagine the interview was so engrossing he lost sight of the speedometer, or perhaps he was racing to his nearest good book store to snap it up. In the book I quote a line from the film Crash (the one moment in the film that recalls the earlier film Crash, based on the J.G. Ballard novel) when the character played by Don Cheadle notes: “We’re always behind metal and glass… It’s the sense of touch. I think we miss that touch so much that we crash into each other just so we can feel something.” In any case, I was in a minivan driving through Beverly Hills with the crew, and as we stopped to enter a parking lot, waiting for a vehicle to exit, the trailing vehicle behind us (also from KCET) was struck by a car that itself was struck by another car. There was a loud, almost familiar sound, and the camera guys bundled out to see what had happened (NB: It’s the second crash I’ve witnessed while out on shoots for the book). It was a classic urban crash. It’s said that close to half of all crashes occur within or near intersections, and in this case it seemed the last car, perhaps rushing to “beat the yellow” didn’t notice the queue of unexpectedly stopped vehicles, and so struck the car (a Scion) behind the second KCET van. The crash raised two issues in my mind: The first, as noted by my colleague Kenneth Todd, being the inherent danger of traffic lights as a design solution. The amber phase tends to encourage people to accelerate to “beat the light,” and they tend to look up at the lights the very moment they should really be scanning the intersection for turning vehicles, etc. 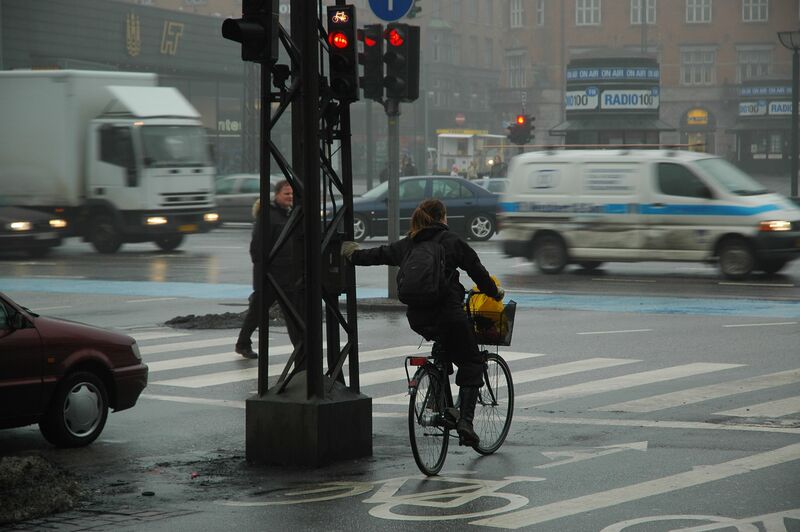 Unfortunately, like all signals in traffic, drivers tend not to rigidly obey their command but use them as only another stage in the decision making process: Should I stay or should I go? The drivers were a bit shaken up, but it was their cars that took the brunt of damage. The Scion driver, commenting on the other driver’s decision at the light, noted how she never accelerates immediately through the green, as so many people are still going through, often at high speed. And she’s right. 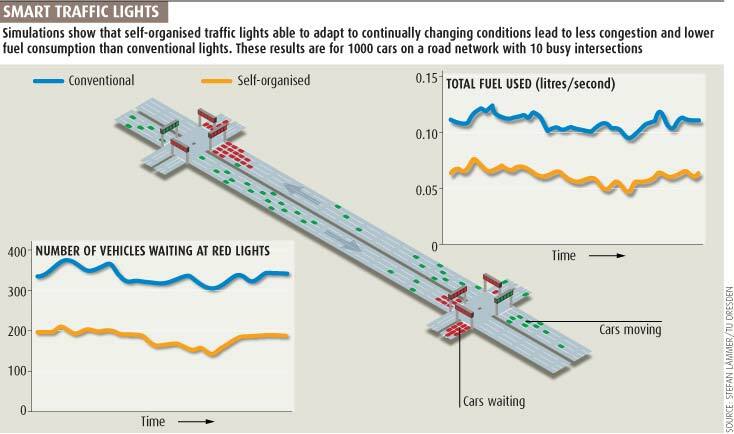 Engineers in many places have had to lengthen the “clearance phase,” or that all-red moment when no one is supposed to go through, precisely because so many people are choosing to violate the red light. But the strange Crash style moment came right when the Scion driver emerged and saw the news crew. She looked at Val and immediately smiled. “I love your show! I watch it all the time.” When I thought about it later, the crash was the first actual encounter with another human we had had in all the afternoon’s driving. Comments Off on Crash. Click here to leave a comment. Comments Off on The List. Click here to leave a comment. From today’s New York Times, about growing inventories of used SUVs on car lots. I’m not quite sure what psychologists would call this — perhaps a focusing effect? “Given how much the automakers and dealers are willing to knock off an S.U.V.’s price, this is not a bad time to buy one, said Jesse Toprak, the director of industry analysis at Edmunds. Yet so many consumers are eager to avoid weekly $100 fill-ups that they are more focused on saving money at the gas pump than at the dealership. And so thousands of Americans have been exchanging their sport utility vehicles for fuel-efficient cars, despite low trade-in values for the larger vehicles and a scarcity of small cars that has allowed dealers to charge sticker price or more for them. Comments Off on Calling Dan Ariely. Click here to leave a comment.